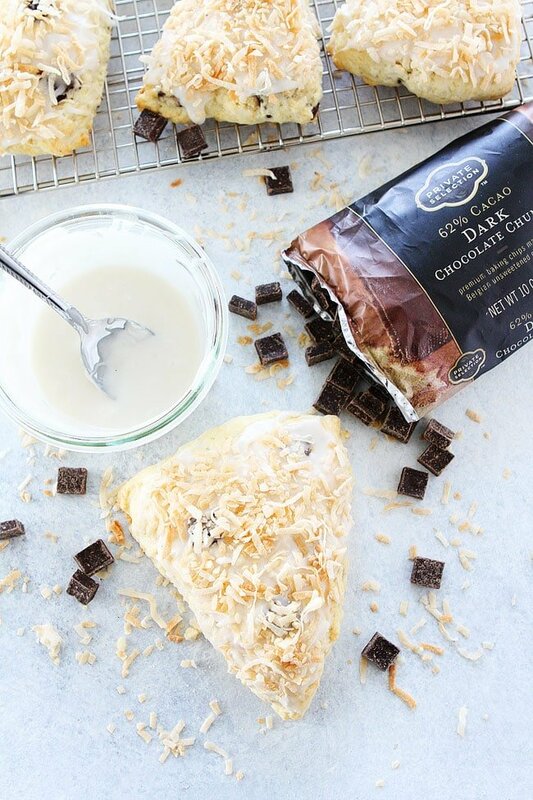 Coconut Chocolate Chunk Scones are made with coconut milk, coconut, toasted coconut, chocolate chunks, and a sweet coconut glaze! Coconut lovers will LOVE this scone recipe. The scones are perfect for breakfast, brunch, or with a cup of tea or coffee. I love a good scone and when I say good I mean NOT dry! There is nothing worse than getting a hard, dry, flavorless scone. Scones should be soft, fluffy, tender, and sweet. 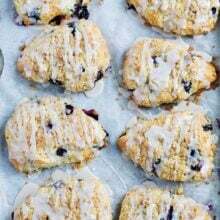 Scones are one of my favorite breakfast treats, or anytime of day treats. There is no bad time of day to enjoy a scone. I am currently obsessed with Coconut Chocolate Chunk Scones. 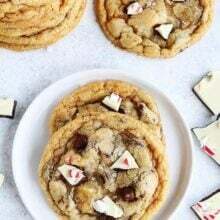 They are LOADED with coconut and the chocolate chunks make them even more amazing! They are the perfect scones! Most scones are made with heavy cream, which is a very good thing. I usually make my scones with heavy cream, but this time I used coconut milk since they are coconut scones. I wanted to maximize the coconut flavor. I used coconut milk from the can (Thai Kitchen brand, I buy it at my Kroger store, Smith’s), the full fat stuff, don’t use lite in this recipe. You want the scones to be nice and rich. The scones also have plenty of butter, remember, we don’t want a dry scone! The scone gets plenty of moisture from the butter and coconut milk. I mix in Kroger sweetened flaked coconut and Private Selection Dark Chocolate Chunks into the scone dough. The coconut and dark chocolate combo is fantastic! I love using the Private Selection Chocolate Chunks because I don’t have to chop my own chocolate and the chunks are nice and big. You can find the coconut and dark chocolate chunks in the baking aisle at any Kroger store. Don’t overwork the scone dough. Mix the dough together and then gently form it into a circle. Don’t over knead or handle the dough too much. You will end up with tough scones if you over work the dough. Cut the scones into eight equal triangle pieces and brush the tops with coconut milk. Bake until the scones are light, golden brown and let them cool completely. Toast Kroger sweetened flaked coconut in the oven. Make sure you watch the coconut closely because it will toast up quickly. The scones also have a coconut glaze made with coconut milk, powdered sugar, and vanilla extract. Glaze the scones and top them with the toasted coconut. The scones are best the day they are made so eat one right away, like as soon as you sprinkle that toasted coconut on top. You are going to enter coconut heaven after one bite! You can eat scones for breakfast, brunch, with a cup of coffee or tea, or for dessert! They are a great treat anytime of the day, and yes, it is ok to eat them for breakfast even though they have chocolate in them. You have my permission:) Talk about a great way to start the day! 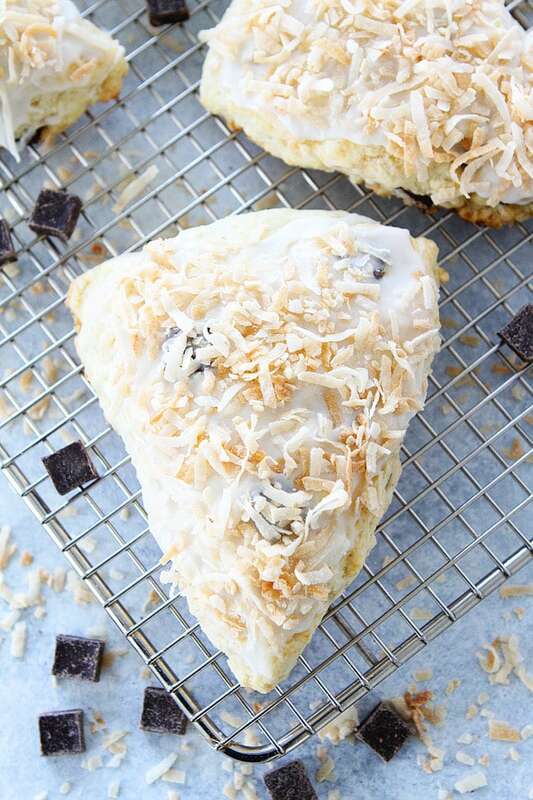 I am for sure making these Coconut Scones for Easter brunch. Coconut is popular at Easter time so these scones are perfect for the holiday. Your family and friends will love them, especially when they get a bite of chocolate with the coconut. They will be blown away! 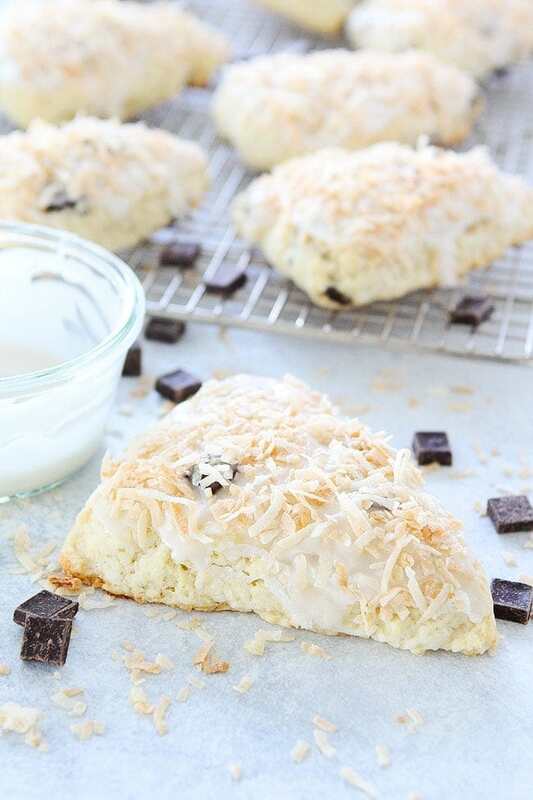 Tender coconut scones with chocolate chunks are great for breakfast or brunch! Preheat oven to 400 degrees F. Line a large baking sheet with parchment paper or a Silpat and set aside. In a large bowl, whisk together flour, baking powder, sugar, and salt. Quickly cut in the butter, using your hands, two knives, or a pastry blender. Mix until mixture resembles coarse meal, with a feel larger butter lumps. Pour 1 cup of coconut milk and vanilla extract over the ingredients and stir with a spatula until dough begins to form. Don’t over mix. Gently fold in the coconut and dark chocolate chunks. Transfer dough to a floured countertop and knead dough by hand just until it forms a ball. Form scones by patting the dough into a 3/4-inch thick circle. Cut the scones into 8 even triangles. Place scones on prepared baking sheet. Using a pastry brush, brush scones lightly with the additional coconut milk. Bake scones for 15-18 minutes, or until scones are light brown. Remove from oven and cool scones on a wire cooling rack. While the scones are cooling, toast the coconut for the topping. Reduce the oven temperature to 325 degrees F. Place the coconut on a baking sheet that has been lined with parchment paper or a Silpat baking mat. Spread out the coconut in an even layer onto the baking sheet. Place in the oven and bake for 5-7 minutes, stirring once, or until coconut is very light brown and toasted. Remove from oven and let cool. To make the coconut glaze, whisk together powdered sugar, coconut milk, and vanilla extract in a medium bowl. Whisk until you reach desired consistency. Drizzle glaze over the cooled scones. Sprinkle toasted coconut over the glazed scones. Let sit until the glaze hardens and the toasted coconut is set. Enjoy! 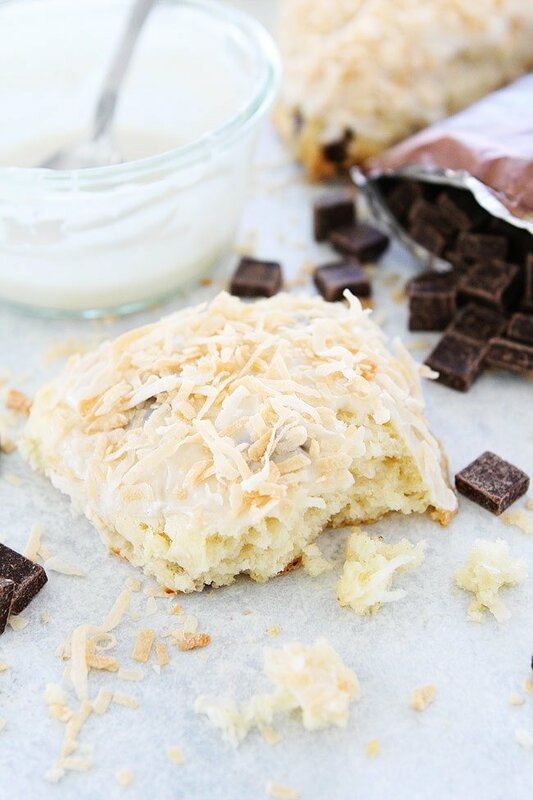 These scones have all my weaknesses in one – coconut and chocolate! Perfect for Spring! Will be trying them this weekend for sure! These are soooo perfect Maria! This flavor combo sounds amazing! I’m the only one in my house that will eat these, but they sound too good to pass up! Can I freeze them and put them in the fridge overnight to defrost? These look so perfect! Love chocolate and coconut together! In LOVE with the coconut chocolate combo! 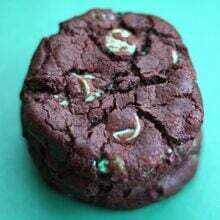 My sister baked a batch yesterday and they were absolutely delicious, love the combo of chocolate and coconut, will be making these again and sharing this recipe!!!!! You are welcome! I am glad you enjoyed the scones! What is the nutritional content of these? Calories and fat? They look amazing! I am not sure on the nutritional info, sorry! Can I make these gluten free? I have gf flour that is 1to1. Yes, if you have a gf flour you like you can use it. Let us know how they turn out! Also, any idea calorie count per scone? You can use heavy cream. I am not sure on the calorie count. Could you substitute coconut flour for the all purpose flour? My husband just fount out he has a gluten problem so I’m trying to help him still enjoy baked goods. Coconut flour cannot be substituted 1 to 1 and requires a lot more liquid. I would recommend using Bob’s Red Mill 1 to 1 flour or Cup 4 Cup Flour (these are both gluten free flours). I know there are other options, but coconut flour will not be a god substitute. Just made these and oh man they are delicious!! It was a spur of the moment decision to make them and I didn’t have coconut milk only coconut cream. They are heavenly! These scones were amazing! I made them without the glaze and the toasted coconut! I added a little extra coconut and chocolate chunks. I also added walnuts per my hubbys request. Just fabulous! I give it 5 stars. So glad you loved the scones! Is the pastry very wet before cutting? I made these today because I love Coconut. They are spectacular! I substitued white chocolate for the dark because my family are no too huge chocolate fans. (I know, right, wth!) saved to make again. Quick easy and so tasty. Yum! Glad you liked the scones!! 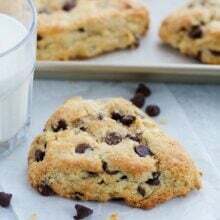 These coconut and dark chocolate scones are absolutely divine! I made them early on Easter morning–Happy Easter! The dough was a little more wet than I expected, and I’m sure I measured everything right, but they did bake up very nicely. I followed the recipe exactly, and I wouldn’t change a thing! The dark chocolate and the coconut are the perfect match. Thank you for a new favorite recipe! SO happy you loved them! Thanks for letting us know! Ibwantbto make them, but I only have unsweetened coconut flakes. Is that ok? Yay! This makes me so happy! Glad they were a hit! They look really good. Could you freeze them? 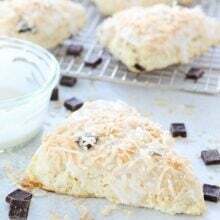 Love scones and what could better than coconut and chocolate which is definitely my favorite combination. I’m showing my baking / cooking weakness and wonder if you could tell me where you find canned coconut milk. Thanks Maria. Just made these today for the Royal Wedding LOL…. any way they were very good and not dryed out like other scones. I did toast the coconut before adding to it to the dough. They look and sound amazing. I put all the ingredients including glaze into the weight Watcher Recipe builder and came up with 23 SP per each scone if cut into 8 servings. If cut into 16 then only 12 SP each. As with all of your recipes, these are ridiculously good. Mine were also still great on day 2! Not sure there will be any left for day 3. I’ll be making these a lot. So happy you loved the recipe! I thought the combination of dark chocolate and coconut in these scones was wonderful, but was disappointed in the texture. I love scones and have made made hundreds over the years. What I enjoy most about a scone is the decadent, buttery crisp bottom crust and exterior, and unfortunately that was lacking with these. The bottom was slightly soft and cakey. The crumb was light and moist, but also slightly cakey. The dough was much wetter than most scone doughs, and sticky, which probably accounts for the softer, cakier, crust and crumb. I should have held back some of the coconut milk; the dough would have come together with less. I’m going to make them again, subbing whipping cream for the coconut milk, and adding coconut extract to enhance the flavor. Most of the scones I’ve made in the past have had whipping cream or buttermilk as the liquid, producing a melt-in-your-mouth buttery exterior, and light flakey, but not dry, crumb. S#@t fire and save the matches! These are delicious and easy! I advise you to make them. So good. I used unsweetened coconut and I cant imagine them any better. Very, very delicious. A tip for the butter. Freeze the piece solid, and then grate the frozen butter. It will incorporate quicker than constant working it in with your fingers. I enjoy making scones. These were especially delicious! No coconut milk but coconut cream worked out just fine for liquid ingredients. Other than that, followed recipe and enjoyed a dark brew with my lovely coconut/choco chunk scone-yummy! Thank you!